A poll disclosed on Monday by Ibope showed that voter support for Brazilian far-right presidential candidate Jair Bolsonaro remained stagnant for the first time. Bolsonaro is at 28 percent of voting intention, followed by left-wing Fernando Haddad, who went up three percentage points and is now only six percentage points away from the lead. Centrist Ciro Gomes remains in third at 11 percent, keeping the same performance he recorded in the last two opinion polls. Right-wing candidate Geraldo Alckmin is in fourth with 8 percent of voting intention, three percentage points ahead of center-right presidential hopeful Marina Silva. 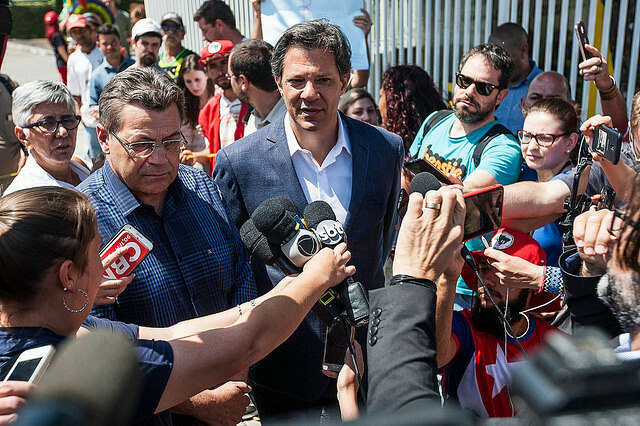 João Amoêdo, Álvaro Dias, Henrique Meirelles, and Guilherme Boulos are at 1 to 3 percent of voter support. Other candidates did not reach 1 percent or were not mentioned by responders. Bolsonaro remains the most unpopular candidate, as 46 percent of voters say they would not vote for him under any circumstances. Haddad, who replaced Luiz Inácio Lula da Silva as the Workers’ Party candidate after the former president was banned from running, is at 30 percent in terms of unpopularity. Among women, Bolsonaro’s unpopularity went up to 50 percent in recent polls, as Brazilian female voters are mobilizing on social media against the far-right candidate, using hashtags such as #EleNão (“Not Him”) and #EleNunca (“Never Him”). Women are also organizing demonstrations across the country on Sep. 29 to protest against the far-right candidate and his conservative platform. In a simulated second-round vote, the poll shows for the first time Fernando Haddad would win with 43 percent of voter support, against 37 percent for Bolsonaro. The previous poll disclosed by Ibope on Sep. 18 showed both candidates tied with 40 percent each.